Super Mario Run is an automatic runner platformer game for mobile devices. 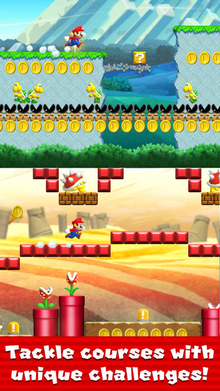 In the game, Mario is constantly moving to the right and the player can make him jump by tapping the screen. 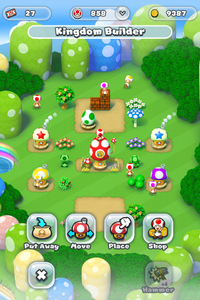 The game features four modes: World Tour, the main game mode where players go through 6 different worlds to rescue Princess Peach, Kingdom Builder, where players can customize their own kingdom with different objects, Toad Rally, a battle mode where players can race against another player's time, and Remix 10, where the player has to play through a series of 10 short courses multiple times as part of a quest to rescue Princess Daisy. Nintendo markets the game as the first Super Mario title that can be played with one hand. The game was initially released exclusively on iOS in 153 territories on December 15, 2016, later released in South Korea on Febuary 1, 2017, and then on Android devices, as well as 11 additional territories, on March 22, 2017. The game was later released worldwide on on March 23, 2017. Super Mario Run is free-to-start, with the full game costing USD$9.99. It is the second mobile application developed and published by Nintendo (following Miitomo), and the first Mario mobile game. Mario in the first stage of the game, Up and Over. Unlike previous installments in the series, Mario (or one of the other 10 playable characters) perpetually runs to the right without any player input. If the player taps on the screen, they will jump, which can be affected by standing on certain blocks. In addition, if the player taps on the screen while sliding against a wall, they perform a Wall Jump away from a wall. The player automatically vaults over certain obstacles and small enemies, such as Pipes and Goombas, without taking damage. Normally, players are able to take only one hit before either being sent into a bubble, which they can then pop by tapping the screen (in World Tour and Toad Rally), or dying (in Remix 10 and World Tour if the player has ran out of bubbles). Instead of a traditional lives system, the player can continue playing a level as long as they have any bubbles remaining. The player starts with 2 bubbles at the start of each level, though more can be obtained by hitting certain ? Blocks. 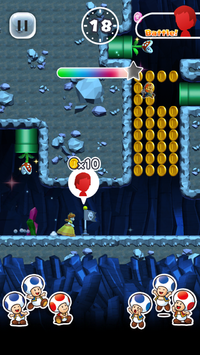 In addition, the player can prematurely use a bubble by tapping the icon on the top-left of the screen, allowing them attempt to collect any collectables they missed earlier in the level without having to restart the level entirely. However, if the player obtains a Super Mushroom, their character grows and can take two hits instead of one, outside of certain obstacles that instantly kill the player. Before the 3.0.4 update, only Mario and Luigi has the ability to take multiple hits, with all other characters instead obtaining 5 coins upon touching a Super Mushroom. In addition, players can obtain a Super Star from certain ? Blocks, as well as from Lakitu in certain situations. While the effects last, players with a Super Star can automatically defeat most enemies simply by touching them and are immune to most obstacles. Each level also has a timer, usually starting with 60 to 90 seconds. If the timer counts down to 0, the player will die, regardless of the number of bubbles they have left. However, many levels have Time Blocks that will grant the player more time when hit. The player's bubble count and time do not carry over between stages or runs of the same stage. While playing the game, players are also able to listen to their own music on their device through iTunes or Google Play. While doing so, the playable character wear oversized headphones (known as Headphone Mario) and have music beats emanate from the headphones. This feature can be activated at any time through a Toad wearing headphones in Kingdom Builder or on the pause screen. World Tour is the main gameplay mode of Super Mario Run, where players are tasked with completing 24 different levels in order to rescue Princess Peach, who has invited Mario for cake from Bowser after he has destroyed her castle. Each level has the player run through a series of challenges, usually centered around a certain enemy or mechanic, in order to reach the flagpole at the end of the level. 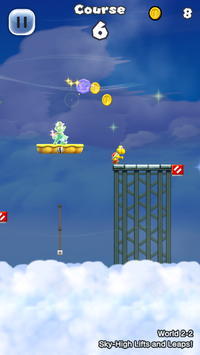 In Castle and Airship levels, instead of a flagpole, the player will have to fight a boss, either Boom Boom (in Airship levels) or Bowser (in Castle levels). Upon completing the first 24 levels, World Star is unlocked, containing 9 levels which can only be unlocked by completing certain objectives. In addition, 4 additional levels can be accessed through special pipes in the Kingdom Builder mode. In every level, five Pink Coins may be found among regular coins and within Brick Blocks. If all five Pink Coins are collected in a single run, Purple Coins are unlocked within the level, which function identically to Pink Coins, but are put in more challenging locations. If all five Purple Coins coins are again collected, Black Coins are added to the level, with different locations to the previous 2 sets of color coins. Levels might have slight modifications made to them depending on which color of coins are available to collect. If the player collects all of the Pink, Purple, or Black Coins within each of the first 24 levels, they will unlock a corresponding colored pipe for Kingdom Builder mode, allowing them to access 1 of 3 bonus levels. In addition, if all of the Black Coins are collected in each of the 9 levels in World Star, the Gold Star Pipe will be unlocked, allowing access to a 4th special level. Worlds 2 through 6, as well as World Star, can only be accessed by paying to unlock the full game. Only the first three levels of the game, as well as the first 30 seconds of the fourth level can be accessed for free. However, starting with version 2.0.0, by completing Bowser's Challenges, players are given an additional 60 seconds on the timer for Bowser's Castle Hangout, allowing them to complete the entire level. In the version 2.0.0 update, an Easy Mode was added, giving an infinite amount of bubbles and time. However, after finishing a level, the player does not keep any Coins collected and the personal high coin count is not recorded. The 24th level, special levels and World Star levels cannot be played on Easy Mode. A Gold Goomba Event are held in this mode. In this event, Gold Goombas appears in certain levels, indicated by a Gold Goomba icon in the level select screen. Defeating a Gold Goomba earns a stamp in the stamp card at the end of a level. During the event, levels with Gold Goombas don't affect the high coin count. There are two types of the Gold Goomba Event: "Mega Event" has four stamp cards with 20 stamps spots each, and "Lite" has four stamp cards with 5 stamp spots each (with the fourth card having 10 stamp spots instead of 5). Event dates and details are shown here. Scuttlebug Forest Jungle Defeat Bowser with Princess Peach in World 6-4. Airship Armada Airship Clear World 1-1 with five coins or less. Fishing Boo Taunts You Ghost House Win Toad Rally three times in a row. Desert Fuzz Desert Collect 30 or more medals in a single round of Remix 10. Dark and Stormy Ghost House Clear World 4-1 with 60 or more left on the timer. Wild Slopes Clouds Clear World 1-2 with 400 or more coins. Scaredy Rat Race Tower Clear World 4-2 without defeating a single Goomba. Spike Bar Jungle Jungle Clear World 5-1 with 300 or more coins. Airship Plunder Airship Defeat 20 or more Ninjis in a single run in World 2-4. Chase the Snaking Coins Cave Collecting all Pink Coins in the first six worlds unlocks a Pink Coin Pipe for Kingdom Builder, which grants access to this course. Piranha Plant Field Plains Collecting all Purple Coins in the first six worlds unlocks a Purple Coin Pipe for Kingdom Builder, which grants access to this course. Make the Cut! Castle Collecting all Black Coins in the first six worlds unlocks a Black Coin Pipe for Kingdom Builder, which grants access to this course. Red Block Run Clouds Collecting all color coins in World Star unlocks a Gold Star Pipe for Kingdom Builder, which grants access to this course. Toad Rally has players compete against "ghosts" of other players in one-minute runs through randomized levels, with the goal being to collect the most coins and Toads. 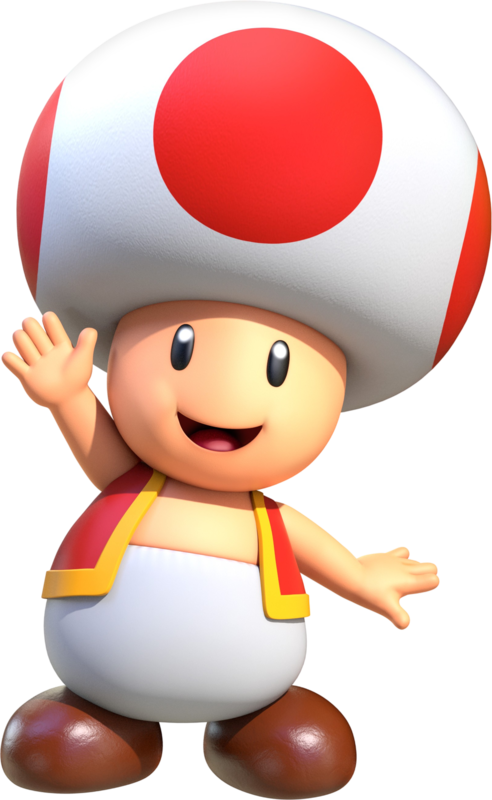 Toads can be attracted by performing certain actions, such as Vaulting Jumps, Rolling Jumps, and stomping on multiple enemies in a row without touching the ground. By performing these actions and collecting Pink Coins, the player also fills up a meter presented near the top of the screen. Once the meter is filled up (or a Super Star is obtained), the player will temporarily enter a Coin Rush, where objects dispense considerably more coins than normal, enemies supply more coins upon being defeated, and Toads are more easily attracted. Coin Rushes can be prolonged by performing certain actions (the same as those that fill the Coin Rush meter) or collecting coins. At the end of the one-minute round, both competitors' total number of coins and Toads are compared, giving them a numerical score. The player with the higher score wins, resulting in them taking the Toads of the other player. If the player wins the match, they gain the Toads both they and their opponent collected during the match. However, if the player loses, they lose a few of their Toads they had before the match started. Using certain characters can also result in a difference in the amount and variety of Toads gained. If the player plays as one of the Yoshis, Toads of the corresponding color are more likely to be attracted. If the player plays as Toadette, the player is able to attract Toads more easily. Players are able to choose between 5 different opponents from the menu screen, each being found in one of 7 different environments. Each match has somewhat randomly-generated levels, with the levels being made up of small segments from World Tour levels using the selected environment, strung together into one infinite level. While matches can initially only be played in the plains environment, they are able to unlock more as they progress through the World Tour. The environment chosen also impacts which colors of Toads can be obtained during the match. In Friendly Run, accessed through the Friends List, the player can compete against the ghosts of friends in a round of Toad Rally. However, unlike a normal Toad Rally, the player will neither gain nor lose Toads. Initially, Friendly Run can only be played once a day. However, the limited number of plays increases to three when World 1 is cleared, and to five when World 2 is cleared. In Kingdom Builder, players can place down various different structures and decorations into the Mushroom Kingdom, allowing them to customize the area to their liking. While most objects are only aesthetic, some objects can be used to obtain coins, Rally Tickets, new characters, or access bonus stages. Objects can be obtained by buying them with coins in the in-game shop, the Bonus Game in Remix 10, and from giveaways during special events. However, most items found within the shop require the player to have a certain number of Toads of different colors, obtained through Toad Rally, in order to buy them. Objects are divided into 3 categories: Decorations, Buildings, and Special. Decorations can be placed on grassy patches of land, while buildings and special objects can only be placed on specific plots of dirt, with some larger buildings requiring 2 or 4 spaces in order to be placed. Special objects are generally interactive or produce some special effect that buildings and decorations do not have. ? Blocks can reward the player with coins or Rally Tickets, special Toad Houses allow the player to play minigames to gain coins or Rally Tickets, colored pipes allow access to bonus stages, and Rainbow Bridges unlock new sections of the kingdom, with even more space to place objects. At the start, only one section of the kingdom is available to place objects on. However, by unlocking more Toads through Toad Rally, more sections of the kingdom can be unlocked, allowing the player to place down more objects. New sections of the kingdom will also have Thwomps blocking certain plots of land, preventing objects from being placed where they stand until the Thwomps are destroyed using Hammers, which can be obtained by completing each world in World Tour, although Thwomps can be replaced as buildings once the player obtains enough Toads. Mario within a Remix 10 course, with a Bonus Medal nearby. Remix 10, introduced in version 3.0.4, has the player go through 30 areas, each containing a series of 10 bite-sized levels all played in a row, in order to rescue Princess Daisy who is lost in Area 30. Each level is filled with 3 Bonus Medals, 5 in the case of "Special Remix," "Secret Course," and limited-time courses. The goal is the complete all 10 stages while grabbing as many Bonus Medals as possible, without dying. Completing ten courses without failing rewards 2 extra Bonus Medals, and collecting all Bonus Medals rewards 3 more medals. No Game Over screen is included; if the player fails to complete a course, they will proceed to the next one. Completing all the stages rewards the player with new items to customize their kingdom in Kingdom Builder mode. However, if the player fails a boss battle against Bowser or Boom Boom, found at the end of each area, they will lose all Bonus Medals earned during the 10 courses and will return to the last Goal Pole, and upon fighting the boss again, the player will be given a Mushroom. Unlike the game's other modes, players cannot choose their character. All levels are played as Mario, except for the fifth level of each run, where Mario is replaced by a different, already unlocked character, randomly selected upon entering the area. In addition, starting in Area 6, the 3rd or 7th level of the run will oftentimes become a "Special Remix," an already existing level remixed to contain a new enemy or element, or "Secret Course," a brand new level not based off of any World Tour stage. Occasionally, the 1st level of a run can be replaced by a "cloud" level that contains a Super Star, 5 Bonus Medals, and a bunch of coins. They only appear when the coin counter ends in double digits (i.e. 11, 22, etc) at the end of the run, and these special stages will only last for 15 minutes before disappearing. Rarely, a sparkling "cloud" level appears instead, which contains a Super Star and a high number of Bonus Medals. One Rally Ticket is required to play Remix 10. However, players who have not purchased the full game are required to wait for a period of time between two games starting from Area 3, or use Rally Tickets to skip the time. 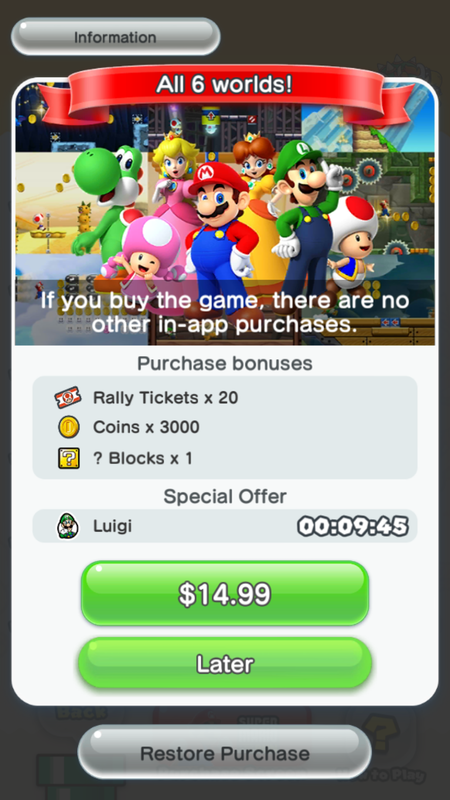 However, as the player advances through the mode, the amount of time between attempts and the number of Rally Tickets required to skip the wait increases. "Weekend Spotlight", which are themed events where the appearance rate for themed buildings are increased (event dates and details are shown here). There are currently a total of 11 playable characters in Super Mario Run. At the start of the game, only Mario is available, with the rest being unlockable through playing each of the different modes. Each character plays differently from each other; Luigi can jump higher than Mario, Toad can run faster than Mario, Peach can float in midair, Toadette can convert some Toads to the player's side before the final tally in Toad Rally, the playable Yoshis can flutter jump and obtain more Toads of their own color in Toad Rally, and Daisy can double jump. Prior to the 3.0.4 version of the game, only Mario and Luigi would grow big and be able to take two hits when touching a Super Mushroom. However, as of version 3.0.4, the rest of the playable characters receive a small form and thus can take two hits before being defeated as well. "It's-a me, Mario! A hero who grows when he grabs a mushroom, Mario's always ready to go!" "Mario's twin brother is shy and easily scared, but that won't keep him from jumping a little higher!" "The princess of the Mushroom Kingdom, Princess Peach can travel great distances with a floaty jump." "A lively princess from Sarasaland. She can reach great heights with her double jump." "This resident of the Mushroom Kingdom faithfully serves Princess Peach with impressive speed." "Her pink pigtails set her apart from other Toads. She's also the referee for Toad Rally." "Yoshi is Mario's loyal adventuring buddy. He can Flutter Jump, and he's got no fear of spikes! Popular with Green Toads." "Yoshi is Mario's loyal adventuring buddy. He can Flutter Jump, and he's got no fear of spikes! Popular with Red Toads." "Yoshi is Mario's loyal adventuring buddy. He can Flutter Jump, and he's got no fear of spikes! Popular with Blue Toads." "Yoshi is Mario's loyal adventuring buddy. He can Flutter Jump, and he's got no fear of spikes! Popular with Purple Toads." "Yoshi is Mario's loyal adventuring buddy. He can Flutter Jump, and he's got no fear of spikes! Popular with Yellow Toads." 1 - Only one Yoshi color will appear in each Remix 10 area. Since the later 5 worlds of World Tour, and by extension Yellow and Purple Toads, are exclusive to the full version of the game, only Mario, Toad, Blue Yoshi, and Princess Daisy can be unlocked in the free version. Connect the game to a My Nintendo account, where the reward can then be redeemed. Play through all of World Tour mode and rescue her from Bowser. Play through Area 30 in Remix 10 mode to help find her and bring her back. 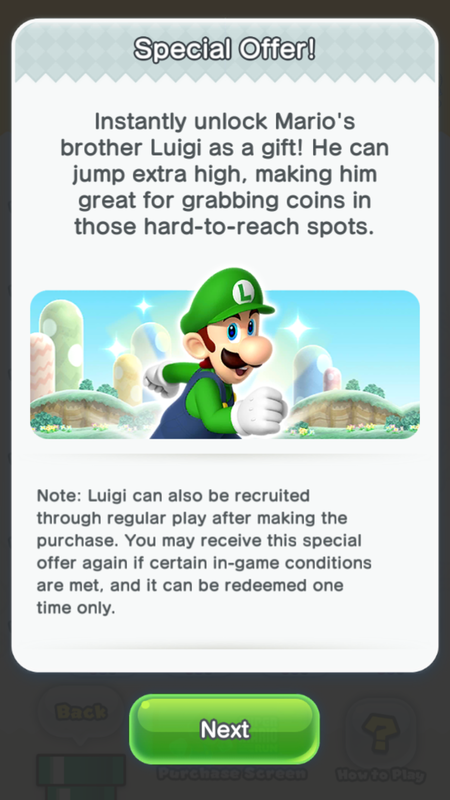 Recruit 150 Green Toads and 150 Purple Toads through Toad Rally to unlock Luigi's House, which costs 1000 coins to be built. Can also be unlocked instantly as a gift when purchasing the full game, through an in-game limited-time special offer. Recruit 200 of each Toad color through Toad Rally to unlock Toadette's House, which costs 1000 coins to be built. Once Mario defeats an enemy for the first time, it is added to the notebook. 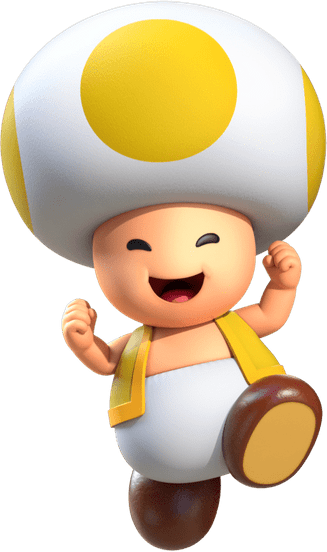 If Mario defeats a certain amount of the same kind of enemy, they will level up and drop more coins than usual when defeated in Toad Rally. "This bad guy seems to show up just about everywhere. Vault over it, or go ahead and stomp it flat!" "One of the members of the infamous Koopa Troop, its shell can be kicked after this foe has been stomped." "This dangerous plant hides in pipes. It's kind of shy, so it won't come out if you're nearby." "This Koopa Troopa is rocking some wings, so it can fly. It's still weak to being stomped, though." "This bunch of bones was once a turtle. Stomping it will make it crumble, but it'll pop back up after a bit." "An enemy that leaps up from lava. Some of these guys can jump really high into the air!" "This ghost really likes sticking to blocks, suddenly appearing and disappearing as it moves randomly." "A shy ghost, this bad guy will stop moving if you look at it. You can defeat it by jumping over it with a backflip." "This red-shelled foe won't just walk off a cliff, but the shell still endangers other enemies if kicked." "A bullet-shaped foe that flies straight through the air. You can vault over it in this game!" "This foe will swoop down from above. Stomping it can send you flying waaay up high!" "A projectile fired from a cannon, it travels slowly in the air. Its smooth surface can easily be stepped on." "This enemy leaps and jumps like a ninja. Oddly, these guys are also pretty good at operating airships..."
"This sharp enemy is no good for hugs. Spinies in the desert are a bit bigger too..."
"This nimble foe rides a cloud and hurls coins and Spinies. Defeat him or he'll keep following you." "A friend of Bullet Bill, this foe will try to seek you out from behind. You can jump over it with careful timing." "This black turtle is protected by a tough shell. It'll sometimes walk on the ceiling, falling on foes below." "This black-colored foe moves along railings. Its body is covered in spikes and is basically unstompable." "This spiky cactus will wobble its way toward you. Painful to touch, it can be defeated by a kicked shell." "This hardworking turtle has a very small shell. It spits up metal balls that it'll throw at its enemies." "This guy serves as an engineer on an airship. It'll pop up and throw a wrench at you from time to time." "This Bowser minion looks like it could blow at any moment. Stomp it and it'll go flying quickly away. Phew!" "This enemy defends the airship with all its might. It likes to fight by trying to ram you while whirling its arms." "This evil king likes to wreck the Mushroom Kingdom. He waits for Mario inside each of the castles he's built." "This enemy enjoys going for strolls in the forest. Vault over it, or just give it a good ol' stomp!" "This foe lives in groups in towers. If you defeat one the rest will panic and scatter!" "This foe hangs from branches in forests. They collect things like mushrooms and coins in their webs." "A ghost that rides a cloud looking for a good fishin' spot. They dangle items from their rods." "A poison bubble known to leap out of swamps. It's too dangerous to even think of touching!" "This may look like a regular Piranha Plant, but they can move objects by blowing on them." *This enemy cannot be leveled up. Obstacles are not included in the notebook as they cannot be defeated. A metal block that emits a column of flames for a few seconds, then stops for a few seconds. A rod of made of fireballs that rotates around a central block. Multiple Fire Bars can rotate around the same block. A ring made of Fire that Mario can jump through. Some Fire Chains have coins or Super Mushrooms suspended within them. A spinning metal saw blade that can remain stationary or move along a track. Small black plants that act similarly to spiked blocks. They cannot be defeated in any way. A rod of made of spiky balls that rotates around a central block. Multiple Spike Bars can rotate around the same block. A rolling ball covered in spikes. They can be thrown by Spikes or Bowser's Koopa Clown Car. Nintendo has supported Super Mario Run post-launch in the form of new content, special events, and bug fixes. The following is a list of updates the game has received since launch. Adds Easy Mode, which allows unlimited time and bubbles. Reduced the number of Toads lost after losing Toad Rally. Toads are now easier to collect. Removed limit on number of times the “Toad” My Nintendo reward can be received to resolve the issue where Toad cannot be received again if, after already having already received the reward, user data is deleted. You can now get Yoshis of 4 different colors to join! Play Toad Rally with a Yoshi of a particular color to get more Toads of that color! More of the game is now available to play for free! You can now play Bowser's Challenge! If you clear it, you can unlock the previously locked course 1-4! In 1-4, Bowser is waiting to take you on! Note: You can check the details of Bowser's Challenge! by tapping 1-4. You can play new courses in Toad Rally! On the new courses, blue and green Toads will appear to cheer you on! Collect blue and green Toads to unlock new buildings in the Shop! Among the buildings you can get is the Blue Yoshi's House, which lets a new character, Blue Yoshi, join your adventure! New buildings to be added! Look forward to the new buildings that will be added in an upcoming event! Easier to get Rally Tickets in the Bonus Game House! You can use the Rally Tickets you get to play Toad Rally! Easy Mode can now be selected at the entrance of World Tour courses. You’ll now be able to clear those trickier courses using Easy Mode, which provides unlimited bubbles and time! The appearance of different colored Toads in Toad Rally has been adjusted. You’ll be able to get loads of Toads and use them to get more buildings! Adjustments have been made to the tutorial to make it easier to understand. The ""How to Play"" tutorial which you can view at initial start-up, or by selecting the option from the bottom right corner of the World Tour screen, is now easier to understand. If you want to learn about Mario's special moves, pink coins and other aspects of Super Mario Run, ""How to Play"" is available for you to check out! Adjusted the number of Rally Tickets that you get from the ? Block. Adjusted the requirements to get some buildings in the Shop. New buildings have been added, including the 8-bit Bowser Statue, Bullet Bill Statue, Bob-omb Statue, and more. Getting them all will be a challenge for players of every skill level! Note: An in-game purchase is required to get certain color Toads required to unlock all buildings. Remix 10, made of some of the shortest Super Mario Run courses you'll ever play, is here! There are also some brand-new courses, a new playable character, and a new feature that lets you listen to your favorite music while you play! Why not try out the updated Super Mario Run? Remix 10: Super Mario Run courses done short and sweet! Even more fun with World Star! Daisy, a new playable character, is here, and she brought a double-jump skill with her! Listen to your favorite music with the music-play feature! The way opponents are selected for Toad Rally has been adjusted. In addition, Peach, Toad, Toadette and the Yoshis receive their small forms along with the other playable characters, and the background for airship courses are gray, stormy clouds instead of white clouds in prior versions. Adjustments have been made to the custom music function and Remix 10. Have fun finding Daisy! The music application no longer automatically starts playing music when Super Mario Run is launched. In Remix 10, if you are beaten by Bowser, a Super Mushroom will appear next time you try. Added a Skip button to opening tutorial. The conditions for clearing Bowser's challenges to unlock World 1-4 have been made a bit easier. Additionally, Kingdom Builder items that were previously exclusive in events (such as the Nintendo Switch statue) are obtainable from the Bonus ? Block in Remix 10. Nintendo had announced that Super Mario Run will be updated to version 3.0.14, dropping support for Android devices with the operating system lower than 4.4. This update originally expected to release in April or May, but rescheduled the update release to "between May and June". Super Mario Run has received generally positive reviews, with the iOS version earning a score of 76 on Metacritic based on 59 reviews and a score of 76.23% on GameRankings based on 30 reviews. The game is generally praised for its simple, yet intuitive controls and that the game retains the quality level design from previous Mario platformers. Critics also praise the social competitiveness of the Toad Rally mode and building objects as motivation from Kingdom Builder. On the other hand, the game has been criticized for its relatively short World Tour length and low replayability of the levels, as well as the requirement for the game to be online. Michael McWhertor of Polygon gave Super Mario Run a 7 out of 10 in his review. He has praised the game for its mechanics being translated well into taps for a touchscreen, but laments how it has been compromised by the lack of power-ups and precise control the series is known for. The review has described Kingdom Builder as a "lengthy grind in service of unlocking mostly cosmetic items." In his final verdict, he has described the game as "an enjoyable but imperfect adaptation of the Mario games for touchscreen devices." Jose Otero of IGN has given Super Mario Run an 8 out of 10,, praising the game for its strong level designs and new mechanics though also citing three-hit boss fights with Boom Boom and Bowser as "relics from Nintendo’s past" and states that "they’re not as smart or clever as the rest of the campaign stages." He has also cited that the visuals are not impressive, especially compared to another mobile auto-runner platformer, Rayman Jungle Run, but has praised Mario's animations within the game. His final statement stated that Super Mario Run is an elegantly designed platformer with strong hooks despite not being the best-looking Mario game by a longshot. iOS Kyle Hilliard, GameInformer 7/10 "Super Mario Run hits its stride when you’re making your way through new levels. The platforming is great, and the level design surprised me on multiple occasions. In these moments, I forgot I was playing a mobile translation of Mario. That fades fast, unfortunately, as Princess Peach was kissing me on the cheek thanking me for my service just as I felt I was getting started. Rewards exist for replaying those levels repeatedly, but they simply aren’t enough for me." iOS Michael McWhertor, Polygon 7/10 "Super Mario Run is an enjoyable but imperfect adaptation of the Mario games for touchscreen devices. Nintendo's unmatched craft in creating platformers is evident during the best moments of Super Mario Run, but the experience is sometimes hamstrung by the game's limited control. The all-too-brief World Tour is its strongest pillar, but I wish there were more to the game beyond playing the same levels again and again." iOS Matt Peckham, Time 5/5 "If you’re able to make peace with the game’s online requirement (and to be fair, I was most of the time), the experience is mostly fantastic. Super Mario Run impresses in ways I wasn’t convinced this approach to the character could. This, let’s not forget, is Nintendo on someone else’s hardware making good. Who else can stroll this assuredly into a stranger’s house, size up the joint lickety-split, then remind us of how much we have yet to see?" iOS Jose Otero, IGN 8/10 "Super Mario Run is an elegantly designed platformer with strong hooks that kept me coming back. Once I wrapped up the main campaign, the addictive, replayable stages urged me to perfect my coin runs. Kingdom Builder and Toad Rally provided further motivation to keep dashing for the finish line, so I could invest the spoils in my own Mushroom Kingdom. While this isn’t the best-looking Super Mario game by a longshot, it successfully distills the core fun and charm of the Mario franchise into a smart, one-handed experience." iOS Peter Brown, GameSpot 7/10 "Simple controls be damned, Run offers great platforming and that distinct Mario charm that Nintendo's perfected over the years. It's a shame to find that it's on the easy side and bereft of a long-lasting platforming adventure, but it's the sort of game that you'll be happy to have in your pocket. Even if you don't play it to unlock every character and special course, finishing the game once will inspire you to dust off New Super Mario Bros. and revisit Run's quality roots on other platforms--a testament to the series' refined DNA than lives on in Run." iOS Damien McFerran, Nintendo Life 8/10 "Super Mario Run is thankfully miles away from being the simplified disaster that many nay-sayers had feared; in fact, what's striking about this mobile release is how similar it is to traditional Mario titles in terms of gameplay and challenge. Despite having limited control over Mario there's still a strong focus on skill, especially if you want to grab all of those pink, purple and black coins. The brevity of the experience is an issue however – an average player should be able to finish an initial no-frills World Tour run in around an hour – and as a result Super Mario Run's social element becomes its long-term focus. Challenging pals via the elegant in-game friends system is addictive, and the Toad Rally mode – which underpins the kingdom-building meta game – is sure to soak up plenty of play time." Super Mario Run received 3.5 million downloads in its first day, eclipsing another highly popular app game, Pokémon GO, which had only 900,000. It has reached the No. 1 spot in the App Store's top grossing and top free charts in the United States. During an October 2017 Financial Results Briefing, it was reported that the app had been downloaded more than 200 million times worldwide, with 90% of the downloads being from outside Japan. Despite the large amount of downloads, it was also stated that the game had failed to reach an "acceptable profit point." As of the October 2018 Financial Results Briefing, the app has been downloaded nearly 300 million times worldwide. Super Mario Run was nominated for the "Best Mobile Game" award at The Game Awards 2017. However, it ultimately lost to Monument Valley 2. Super Mario Run also achieved 2017's "Most Downloaded New Game" from Google Play. One of the promotional images for the game found on the App Store. Run and jump with style to rescue Princess Peach from Bowser’s clutches! Travel through plains, caverns, ghost houses, airships, castles, and more. Some of the shortest Super Mario Run courses you'll ever play! This mode is Super Mario Run in bite-sized bursts! You'll play through 10 short courses one after the other, with the courses changing each time you play. Daisy is lost somewhere in Remix 10, so try to clear as many courses as you can to find her! In this challenge mode, the competition differs each time you play. Compete against the stylish moves of other players for the highest score as you gather coins and get cheered on by a crowd of Toads. Fill the gauge with stylish moves to enter Coin Rush Mode to get more coins. If you win the rally, the cheering Toads will come live in your kingdom, and your kingdom will grow. ・ All courses in World Tour are playable Why not try out the bigger challenges and thrills available in all courses? ・ Easier to get Rally Tickets It's easier to get Rally Tickets that are needed to play Remix 10 and Toad Rally. You can collect them in Kingdom Builder through Bonus Game Houses and ? Blocks, by collecting colored coins in World Tour, and more. ・ More playable characters If you rescue Princess Peach by completing course 6-4 and build homes for Luigi, Yoshi, and Toadette in Kingdom Builder mode, you can get them to join your adventures as playable characters. They play differently than Mario, so why not put their special characteristics to good use in World Tour and Toad Rally? ・ More courses in Toad Rally The types of courses available in Toad Rally will increase to seven different types of courses, expanding the fun! Along with the new additions, Purple and Yellow Toads may also come to cheer for you. ・ More buildings and decorations in Kingdom Builder The types of buildings available will increase, so you'll be able to make your kingdom even more lively. You can also place Rainbow Bridges to expand your kingdom. ・ Play Remix 10 without having to wait You can play Remix 10 continuously, without having to wait between each game. Super Mario Bros.: Various sprites are featured as decorations for Kingdom Builder. The background music for Remix 10 features a remixed version of the overworld theme. Super Mario Bros. 2: Ninjis return from this game, retaining their appearance from the NES version. The background music for Remix 10 features a remixed version of the underground theme. Super Mario Bros. 3: The background music for Remix 10 features a remixed version of the overworld theme. Super Mario Land: Mario once again rescues Princess Daisy. Remix 10's background music features the remixed version of the underground theme, and Daisy's character description mentions Sarasaland, a location from this game. Super Mario World: When the blue star triggering Coin Rush is released, the "item dropped" sound effect from this game plays. Remix 10's background music features the remixed version of the overworld theme. The Blue Bonus Game House has a minigame that is played the same way as the Bonus Game from this game. Super Mario World 2: Yoshi's Island: When the player grabs a Super Star in Remix 10, a remix of the Powerful Infant theme from this game can be heard. Mario Party 8: Princess Peach and Bowser's artworks are taken from this game. Some of Princess Daisy's voice clips originate from this game. Mario Party DS: Yoshi's artwork is taken from this game. New Super Mario Bros. 2: The music for the Coin Rush results screen is reused in this game, which is heard after clearing a course. The sound effect that plays when a ? Block releases a Gold Flower is heard when a Roulette Block releases three Super Mushrooms/Super Stars. 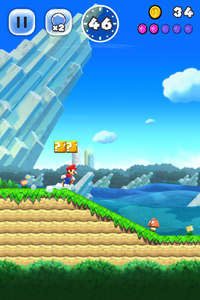 New Super Mario Bros. U: Graphics are taken from this game. Music from this game are also rearrangements. Some of the crowd cheers are also taken from this game. Super Mario 3D World: Toad's artwork is an edited version of his artwork from this game. Mario Kart 8: The timer countdown jingle from Battle Mode is reused for the countdown jingle in this game. Some of Luigi's, Princess Peach's, and Toadette's voice clips are reused from this game. Mario Party 10: Toadette's artwork is taken from this game. Super Mario Maker: The Airship tileset is taken from this game. The axes at the end of a castle levels function the same as the axe from this game, rather than a button in New Super Mario Bros. U. The Key design is also taken from this game. Many objects use their appearance from the New Super Mario Bros. U style. New Super Mario Bros. U Deluxe: Some of Toadette's animations, such as her "Course Cleared" animation, are reused in this game. For this subject's image gallery, see Gallery:Super Mario Run. For a complete list of media for this subject, see List of Super Mario Run media. Super Mario Run is the first Nintendo game to be officially localized to Brazilian Portuguese. Despite having no official Simplified Chinese language support and no official release in mainland China, Super Mario Run has an official FAQ page in Simplified Chinese, along with the other officially available languages. The Simplified Chinese FAQ can be viewed here. On December 8, 2016, a demo of Super Mario Run was made available at Apple Store outlets worldwide. The MP3 background music added to the official site for the Ver. 3.0.4 (28 September 2017) update contains metadata - notably the TPE4 tag ("Interpreted, remixed, or otherwise modified by"), which has the value of "Kenta Nagata". ↑ Schreler, Jason (September 7, 2016). Nintendo Announces Super Mario Run For iOS [UPDATE: Android Later]. Kotaku. Retrieved September 8, 2016. ↑ https://twitter.com/NintendoAmerica/status/844663256614649858 Twitter. Retrieved March 22, 2017. ↑ Nintendo AU NZ. (January 20, 2017). March release announcement. Twitter. Retrieved January 20, 2017. ↑ Brian. (March 12, 2019) Super Mario Run version 3.0.14 on the way, dropping support for Android OS lower than 4.4. Nintendo Everything. Retrieved March 18, 2019. ↑ Brian. (April 3, 2019) Super Mario Run version 3.0.13 update now available on Android. Nintendo Everything. Retrieved April 3, 2019. ↑ Metacritic score for Super Mario Run. Metacritic. Retrieved December 16, 2016. ↑ GameRankings score for Super Mario Run. GameRankings. Retrieved December 16, 2016. ↑ McWhertor, Michael. (December 15, 2016). Super Mario Run review. Polygon. Retrieved December 16, 2016. ↑ Otero, Jose. (December 15, 2016). Super Mario Run Review. IGN. Retrieved December 16, 2016. ↑ Pereira, Chris. (December 16, 2016). Super Mario Run Triples Pokemon Go's First-Day Downloads, But It Had Advantages. GameSpot. Retrieved December 16, 2016. ↑ Andriessen, CJ. (October 31, 2017) Super Mario Run hits 200 million downloads, but sales are still lacking. Destructiod. Retrieved January 14, 2018. ↑ Brian. (October 31, 2018) Super Mario Run closing in on 300 million downloads. Nintendo Everything. Retrieved October 31, 2018. ↑ 16.0 16.1 Awards - The Game Awards 2017. The Game Awards. Retrieved December 9, 2017. ↑ Announcing Google Play's "Best of 2017". Google Play Official Blog. Retrieved December 1, 2017. ↑ Cipriani, Jason (December 8, 2016). Play Super Mario Run in Apple Stores starting today. ZDNet. Retrieved December 8, 2016. This page was last edited on April 12, 2019, at 08:53.